if any user one can tell me about its using flexibility,speed or if any problem like hanging...then I ll b thankful...bcos I am a step ahead to get the cell. does it support usb ???..? Can I know that the PLS LCD & SUPER AMOLED got any different? Which one is better? can anybody plz tell me it comes easily in the pocket.......plz tell me guys.....bz i m going to buy this tab..???? Does it has a SIM card slot?? is it have big border. Its real Fast and All Possible feature works on it. ICS is a Boon. 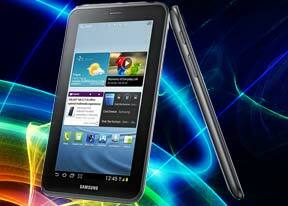 Thanks Samsung for such a Beautiful Handset/Tablet..
king, 24 Jun 2012wat better galaxy tab7.0 plus or tab 2 7.0? tab 2 p3100 better than tab 7.0 plus p6200..
the specifications is almost same.the different is p3100 using ice cream sandwich OS..
Who knows if it is posiible to use this device with network connections (like: USB Modem or etc)? Thanks. My tab is hanging when i am playing games.Does anybody have hanging problems like this??? ?